New Lounge: Disney has opened a new lounge in Dinoland. Its taking over the garage section of Restaurantosaurus starting at 5 pm. They've added lanterns and secluded the lounge from the rather noisy areas of the place. There is outdoor seating, as well. The menu is quite limited with three non-alcoholic, four alcoholic drinks and 2 small plates, buffalo chicken dip and mixed nuts. Maybe if this place is well received they will expand the menu but for now it seems like a nice place to get out of the heat for a bit. New option at Tiffins: One of our favorite places is, of course, Tiffins. They have started a new Prix-Fixe option at lunch. You can select an appetizer and entree or an entree and dessert. The apps include the apple walnut salad and falafel. The entrees you can select include the Wagyu Beef Tagine or roasted chicken. Desserts include the chocolate ganache and the guava mousse. The price isn't too bad considering this is a signature restaurant. It is $35 per guest. You can still order off the regular menu, this is just an option, not a replacement. Also, it is from 11 am to 3:30 pm. 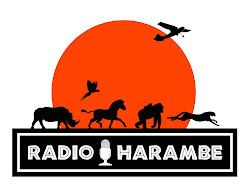 Episode 138 of Radio Harambe - Zoo or Nahtazu?